During our time at the cottage we acquired extra stuff, otherwise we would have been living in an empty house. It wasn't an excessive amount of stuff, but we had to figure out what to do with the things that we adopted during the winter. Bringing all of our stuff to the tiny house wasn't an option. For example, we ended up with 12 coffee mugs, 6 water glasses, 2 Scotch glasses, 6 wine glasses, 3 insulated Klean Kanteens, plus 3 plastics cups that came with my NutriBullet to make smoothies. And that doesn't include the Mason jars we brought to the rental for food storage. Some of the mugs and glasses were donated to a local thrift store and some came back to the tiny house. It took us longer than we expected to move out of the cottage and to clean the space. We spent Saturday and Sunday afternoon moving our stuff, cleaning, mowing the law, and taking care of other odds and ends. Plus, we had to swing by the house to finish up cleaning tasks earlier this week. Moving always takes more effort than I expect. 1. If you are transporting stuff in a truck, use extra bungee cords and ropes. 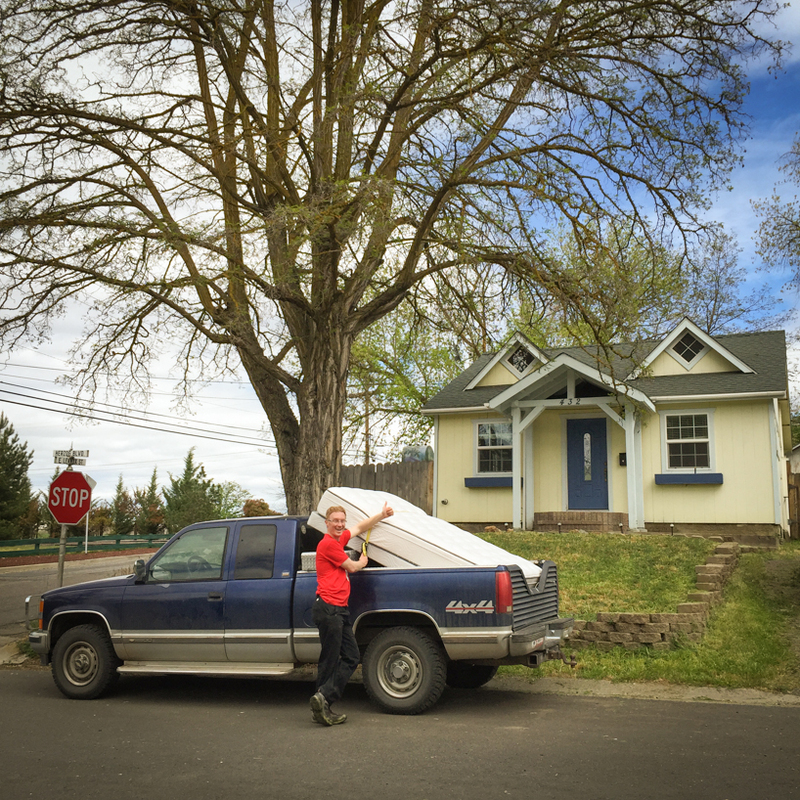 My father-in-law let us borrow his truck to move our queen mattress. We strapped it down in the truck and thought it was secure. However, on the short drive to the ranch, the mattress came close to blowing out of the truck. Thankfully, that didn't happen. Logan pulled onto the side of the road, fixed the strap, and we continued onward. 2. Before I put Elaina in the cat carrier for transport to the tiny house, I made the mistake of giving her water. She peed in the carrier and soaked herself in the process. Elaina growled and hissed at us as we cleaned her with baby-safe soap and water at the tiny house. I felt so bad for her! She hates change. At least Elaina forgave us later in the evening. 3. Be patient. Despite the hissing and paw-boxing, the cats are adjusting to the tiny house. Before our move to the rental, they lived in the space and in various cities with us for three years. I’m sure they will sort out a turf treaty, and in the process learn to be patient again with one another. Logan and I have to sort out our own turf treaties, too. Reorganizing the closet, pairing down our bookshelf, and sorting through our camping gear and kitchen stuff is on our to-do list. We have to be patient with each other as we reorganize our stuff and our day-to-day routine at the ranch. 4. Let go of stuff. We opted not to store the belongings we acquired during winter. We gave our double bed to Logan's cousin and took glasses, mugs, clothes we no longer needed, and extra bedding to Goodwill. We tried to squeeze our queen bed into the loft, but it barely fit. We opted to keep our futon and give the queen bed to our in-laws. It's a great addition to the big ranch house, and I'm happy it will be used. 5. Be grateful. I’m glad we moved into Yreka for the winterbecause the change was good for us at the time. However, being back in the tiny house feels good. We love our neighbors, the scenery, and the quiet. I’m grateful to be back home. It's the last week to register for my online photography course! Details here. Have you signed up for my little letter? Read the backstory here.